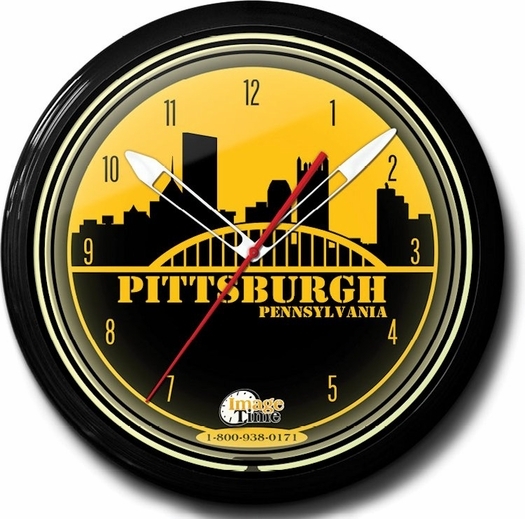 Fans of Pittsburgh, Pennsylvania will enjoy having this 20 inch neon clock adorning their wall. Image Time specializes in providing customers with high quality clocks. All clocks are unique in design and consistent in reliability. Image Time clocks have earned recognition and fame for dependability. Their clocks tick for well over 100,000 hours or more without any problems, providing a long lasting service to all customers for over 11 years per clock! Expert packing delivery services and shipped direct from the factory via UPS. Recipients of this wonderful clock can show off their pride and loyalty to Pittsburgh by displaying it anywhere. A Pittsburgh Neon Clock by Image Time makes a wonderful gift! Subject: Neon Clock for fans of the city of Pittsburgh. Ask a question about Pittsburgh Pride Neon Clock, High Quality, 20 Inch.